Global Marine Group (GMG) announced that it has been awarded a contract from E.ON to install a fibre optic cable at the Rampion Offshore Wind Farm, under construction 13km off the coast of Sussex, UK. Upon completion the cable will run from the shore to an offshore substation, providing a vital communications link for this major wind farm. The installation is expected to be completed later this month. CWind, which is part of the GMG and is responsible for delivering the Company’s power capabilities, will execute the contract and will utilize the Group’s capable assets and project engineering team. 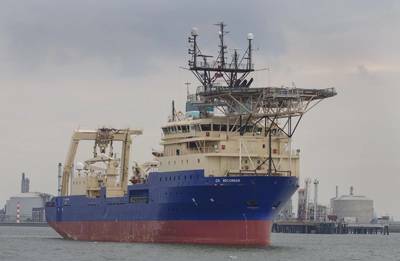 The installation will center on a 96-fibre armoured cable supplied from Hexatronic, installed by the CS Recorder using the proven Hi-Plough to ensure appropriate cable protection in the hard chalk seabed. Due to be completed and operational in 2018, the Rampion Offshore Wind Farm, owned by E.ON, the UK Green Investment Bank plc and Canadian energy company Enbridge, will generate 400MW of power, the equivalent of the electricity used by almost 347,000 homes, comparable to around half the homes in Sussex.